Filed to: CANDY NEWS!Filed to: CANDY NEWS! 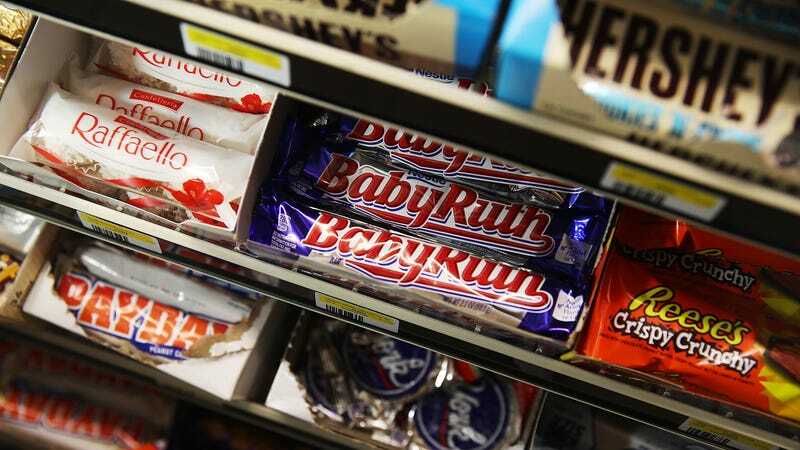 Nestlé is offloading several of its American candy brands, including Butterfinger, Baby Ruth and Nerds, in order to focus on the umpteen-million other products they produce. The buyer? Italy’s Ferrero International SA, the makers of Ferrero Rocher, the most random candy. Nestlé “said Ferrero will acquire more than 20 of its U.S. confectionery brands, allowing the company to focus on non-candy products from its U.S. division like pet products, bottled water, coffee, frozen food and baby nutrition,” reported CNN Money. Nestlé’s press release notes that they’re keeping international candy brands including KitKat and also TollHouse. While Hershey bid against Ferrero for the Nestlé assets, the U.S. company is also diversifying beyond sweets—as is its biggest domestic competitor, Mars Inc.
Last year, M&M’s maker Mars, the world’s largest pet-food manufacturer, purchased a veterinary clinic and dog day-care operator VCA Inc. for $7.7 billion. It also bought a minority stake in KIND LLC, which makes fruit-and-nut bars. Hershey said last month it would buy SkinnyPop popcorn owner Amplify Snack Brands Inc. in its largest deal to date, valued at $1.6 billion. Bring back those ridiculous Butterfinger “Snow Bro” guys they made two Christmases ago. Send them directly to my house. They are absurd but delicious. Literally any additional uses for Nutella. Just keep ‘em coming. Thanks in advance, Ferrero International!